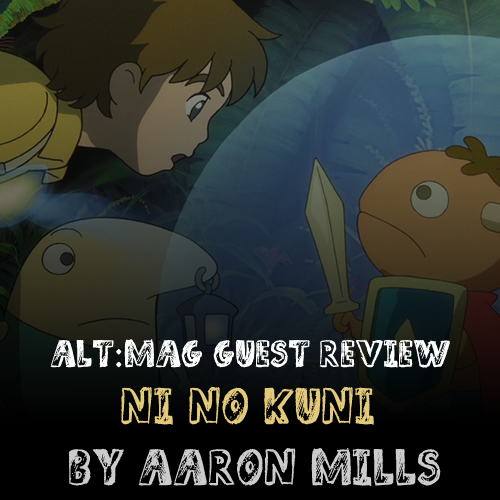 Thank you to our good friend Aaron Mills for this great review of Ni no Kuni: Wrath of the White Witch for the PlayStation 3! 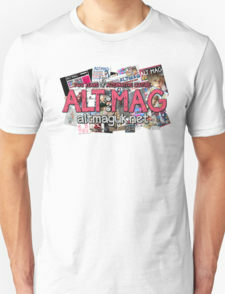 If you want to submit a guest review to Alt:Mag just drop us a line via our Facebook page or our Twitter page! I'm a fan of both Japanese role-playing games and the work of the legendary animation studio Studio Ghibli, so when I heard that Ghibli were at last making their first foray into the world of video games, with JRPG masterminds Level 5 (of Dragon Quest VIII, and creators of the Professor Layton series) at the helm, I knew that this was a game that needed to be played. It may have taken me 50 hours before the story reached it's resolution, but my word was it worth it. 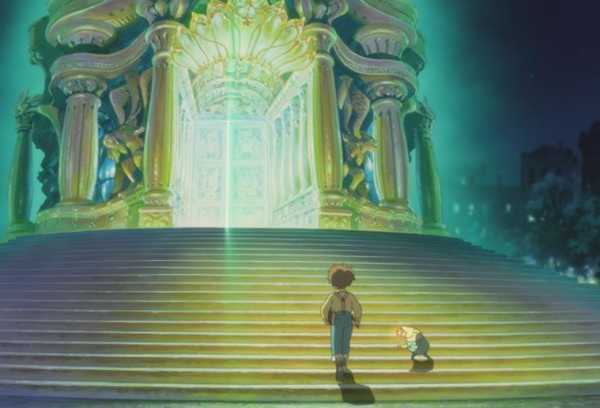 Ni no Kuni: Wrath of the White Witch sets us as Oliver, a young boy who, by way of a tragic accident finds himself alone and desolate, before his tears awaken Drippy, his favourite toy, who tells him he's actually a fairy from another world ruled over by an evil wizard known as Shadar, the Dark Djinn, and that Oliver is the only one who can restore the world to it's natural balance. He tells him this all with a hilarious Welsh accent, might I add. 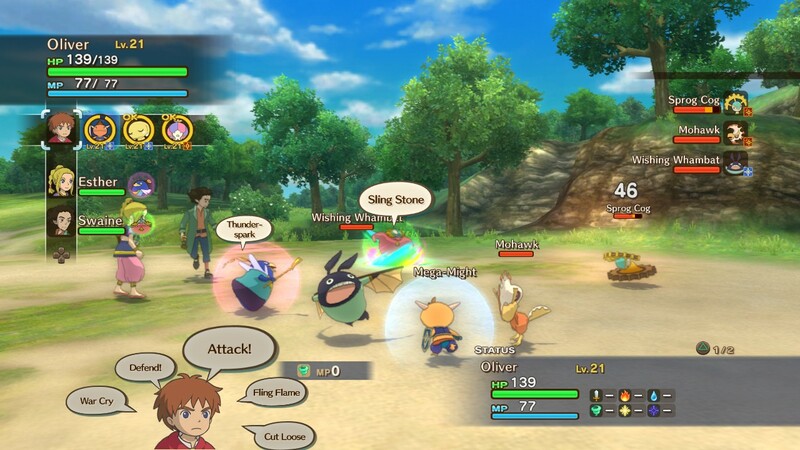 So it is that we find ourselves not in Oliver's home-town of Motor City, but in a fantastical universe full of magic and unusual creatures, and early into the game we are introduced to the main mechanic of the game's story (at least for the most part): Shadar has broken the hearts of the people of the land of Ni no Kuni, and Oliver is the only one who possess the ability to mend their hearts and stop Shadar. The 2 worlds Oliver knows are connected via the souls of the people; for example, the king of the first city you visit in Ni no Kuni, Ding Dong Dell, is a cat known as King Tom, but in Oliver's world he is simply the pet of a local shop owner. When a character in Ni no Kuni is suffering from brokenheartedness, Oliver has to travel back to Motor City by a magical gateway to find their soul-mate in his world, and solve their problem, thus curing the character in Ni no Kuni. The story is certainly not ground-breaking, and sadly relies on this mechanic rather heavily, but thanks to Ghibli's wonderful creativity, the world itself is simply a joy to behold, and so the game is still a delight to experience, even if it suffers from more tiresome moments. There are twists in this story that are genuinely very good, perhaps not Hitchcockian quality but as far as video games go, some of them were brilliant. Oliver may be able to mend a broken heart with just his wand, but that alone is not enough to traverse a world full of creatures looking to attack, and here is where the familiars are introduced into the story. In a Pokémon-meets-Ghibli style, Oliver has the ability to command familiars, creatures that he can use to fight for him. Though you start off with just one familiar, gradually your party grows until you have three familiars that Oliver can control, as well as 2 other companions who can each have three as well. However, to stop the game becoming a routine of swapping familiars when one is low on health, the master and creature share the same health source; when Oliver's familiar takes damage, so does Oliver. The combat itself is presented in an interesting style. Instead of the turn-based combat you know from the Final Fantasy series and other such JRPGs, there is a system in which you or your familiar are free to run around the battle area as you please (a system used very well in allowing the player to control the space and range between themselves and enemies) and whenever you press a command, you have a timer for how long they will do this command – so pressing 'Attack' once will usually have one of the faster familiars attacking 5 or 6 times per timer - and then how long until you can do it again. The combat is decent, but it's not perfect, and a large part of this is down to the AI. In fact, I don't think they should even be referred to as “AIs” because there is no intelligence to be observed, artificial or not. Your companions will constantly either waste all of their MP within moments of a battle commencing, using their most MP-heavy spells or abilities almost immediately, or will allow for themselves to die by their own stupidity. Let me just suggest that it is not entertaining to go into a boss battle you've been grinding a good hour or so for, just to watch as your companion attacks the boss on their own and not by a familiar, their health rapidly draining with each blow from the boss while they deal their own mighty hits of 1 damage each. There was one particular area of the game in which a common enemy creature had a one-hit-kill move, and whenever he hit Oliver with it I would simply put down the controller until the other 2 had died. Such was the pain of trying to use such floundering idiots when you're accustomed to playing as someone with at least some individual use on a battlefield. The game wants you to master its combat system, to switch between the three characters and their familiars, to use all of your collective abilities and bring forth a cohesive, tactical battle. However, whilst Oliver can hold his own when not using a familiar, thanks to his spells, the other 2 characters really don't have anything of substance to offer if one tries to use them as anything more than a vessel for familiars, and this was something that could be exceedingly frustrating at times. More often than not, the real boss battles were trying to keep the bloody morons alive while they stand plain-faced in front of a monstrous creature, and downright refuse to defend when the boss gears up for a big move. Something I eluded to when first mentioning the AI, of course grinding is a major part of JRPGs and Ni no Kuni is no different there. I personally found that for most of the game I didn't need to grind for very long, and that usually 1-2 hours per new area was adequate. However, in that one area I referred to with the one-hit-kill enemies, I did find myself very under-levelled, and ended up spending hour after hour battling away in a desperate attempt to get myself strong enough to pass through the level, only to find I'd levelled up so much that the boss was a total walkover in the end. However, while grinding may not be a necessity, the Pokémon-esque familiar system meant I found myself whiling away the hours to get their levels up. Every battle ends in XP given to the player, and as you gain more XP your familiars gain levels and become stronger. You know the system, we've all been there. When they reach a certain level, they can evolve, or be “metamorphosed” (a word I feel sounds far too complicated for such a simple concept). However, unlike Pokémon, you will soon find that if you are someone who craves the top-tier stats, then you won't want to evolve your familiar right away, as hitting the level cap for that familiar before evolving it will make them much stronger in the next form. Each familiar has three forms, the final giving you a choice between 2 alternatives, and each time you evolve the familiar their level resets back to 1. So it becomes a highly addictive mechanic of levelling up familiars to make them stronger. Fortunately, each familiar gets the same XP whether they fought or not, so if you're a tactician then you can stagger your evolves so that you always have one strong familiar on the field. It's a good thing that they managed to make the familiar element of the combat as strong and tactical as they have, because it makes up for the failures of the 3 character system earlier mentioned. However, they may potentially have overdone it in parts, because it's near impossible to truly understand the battle system without looking online. Each familiar has a sign attributed to them – either sun, moon, star or planet – and in a rock-paper-scissors motif, you are encouraged to choose which familiar to send into battle by which sign beats the ones your enemy has. But here is where it gets confusing; there are also double signs, and trying to work out exactly what to send out can be a nightmare. I'll explain the signs now, and you'll see how it can become rather hectic. Sun beats moon, moon beats star, star beats sun, double planet beats all three, single planet is strong against neither sun, moon or star but deals massive damage to double planet. Still with me? Because now we have to add in the elemental damage, of fire, ice, storm (something a bit hazy between wind and lightning), earth, light and dark. Allow me to tell you that it can be a real pain when you go into battle and you need a moon-based fighter who isn't weak to fire but can also use ice magic. It gets far too convoluted for its own good at times. But for all its irritating and unnecessary flaws, this is still a fantastic game. The world is truly beautiful, and a feast for the eyes. From the luscious green hills you start in, the wonderful charm of the cities you travel to, to the gorgeous water effects when you need to use a ship to get from one area to the next, this game is visually incredible. There is such an acute attention to detail in place, the list of the price of yoghurt in Miss Leila's shop in Motor City, the green paw-prints that lead the way to King Tom's palace in Ding Dong Dell, everything about this game screams the effort that has been put in to make this expansive world as immersive as possible. Oliver has a book called The Wizard's Companion, and in this book there is a list of all 400 of the familiars you can find in the game (with beautiful Ghibli drawings of each), detail on all the armour and weapons, and even fairytales for those who want to enjoy the universe for everything that it is. The game sounds absolutely amazing as well. Legendary composer Joe Hisaishi, the man responsible for the acclaimed music of the Ghibli films, brings us an orchestral masterpiece. Some of the songs in this game are a musical triumph, from soft sweet-sounding numbers to huge swooping crescendos. The tunes are all wonderfully crafted and memorable, and Hisaishi deserves immense credit for the work he has done here. That he composed all 21 songs over the course of 7 days is sheer madness to me, but when you've been creating sheer beauty for so many years, I guess it comes easily. 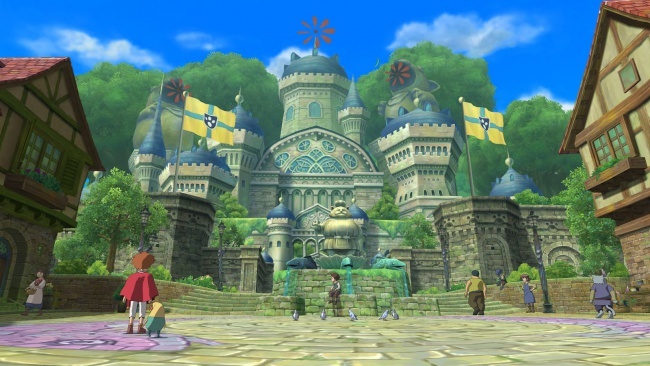 A huge part of the fun of Ni no Kuni is the charm, as is often the case with Ghibli, and there certainly is plenty of it. There are some of the most gloriously terrible puns (King Tom is referred to as “Your Meowjesty”), a small quest where you have to chase a lost red herring, and a familiar called “Captain Whamtastic” who wears shades, a Super-man style top and a quiff. There is a group of creatures called Tomtes, who talk like stereotypical Norwegians; “It is being very cold for me today, yes?”. One of them is called My Neighbour Tomtoro, in a lovely reference to a Ghibli film. You even get to see 2 Welsh fairies do a stand-up routine. If quirky charm is what you want, rest assured that you'll get more than enough of it here. The voice acting in this game has its ups and downs. While Drippy is hilarious with everything that he says, some of the voices are absolutely horrid. Oliver's cheesy American voice can be irritating at times, the many English characters almost all talk in that despicable posh English accent that none of us actually sound like, and there is one character who has the worst voice I've ever had the pain of hearing in a video game. Seriously, he sounds like a bloody Tweenie. I despised that character. Shadar, however, sounds fantastic and the fairies are so entertaining to listen to that I can forgive the bad voices. Except for the Tweenie. He deserves death. Painful, painful death. So while this game does have its flaws, they do not mar the experience at all, and I felt totally engrossed throughout all 50 hours it took me. There's even things to do post-game to keep you playing after the story reaches its conclusion. All in all, this is a wonderful gem of a game, and if you like role-playing games, or just need something different and refreshing to offer up a different choice than first-person shooters, you owe it to yourself to play this game. It's a truly magnificent experience.